Realtime Paint, available for Android through the Google Play Store, is a free app that offers many features that popular painting apps charge a hefty premium for. The main draw of the app, if you will pardon the pun, is the ability to completely collaborate on artistic or professional projects online, with friends or colleagues. If you have ever collaborated on a Google Docs document, you will know what this looks and feels like, as you literally see the lines and plant being created in front of you. It is rather magical, the first time you see it. 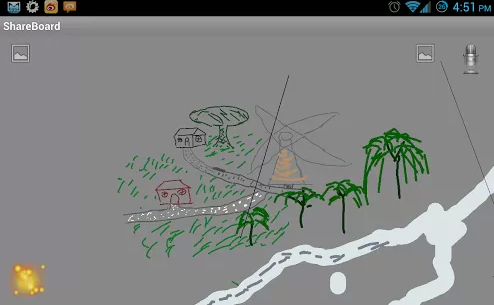 The app lets you collaborate on a ‘shared board’, with friends, or you can simply use it to draw alone. * Unlimited Zoom in / Zoom out! * Share a boundless board with a group of people. * Share your art with your friends through Facebook, Google+, email etc. * Set your Board as publish with or without read-only permission. * Text Chat while Drawing. * Store your paint in the cloud. The app has all the standard drawing and painting tools, and lets you zoom in to an incredible level, to make correcting those perfect details as easy as possible. Once you and your friends have finished your shared masterpiece, you are free to upload it and share it on Facebook, Google Plus and via Email, as well as a range of cloud options to store the art for later use. The app is very easy to use, its sharing and collaboration features are peachy and the best news of all? It is completely free to download with no charges whatsoever for using it. Overall, this is a smart art app, and you would be smart yourself to snap this up.